A couple of times recently I saw people asking for advice on how to read Shakespeare. Normally this turns into people telling them that Shakespeare was meant to be performed, not read. So what they should do is to go find a live production of the play they were thinking about reading and watch it instead. I’ve always hated that response. I don’t think that anybody in the history of that question has ever meant, “Hey, I’ve got a choice between seeing a live production of this play, or reading it, what should I do?” If somebody wants to read Shakespeare, why are we trying to stop them? Either they are a student who has to, or are trying to learn more on their own. I think we should be encouraging that, not trying to talk them out of it. To that end, I’ve come up with a new recommendation that I’m going to start using. I call it Speed Reading Shakespeare. I can’t say I’ve taken it for a spin yet personally, but I look forward to doing so because I can’t see why it wouldn’t work. Let’s pick a play as our example. Shall we say A Midsummer Night’s Dream? Great. I’m going to assume that you have, or can get your hands on, a reasonably modern edition of the play. By that I mean it should have some degree of footnotes/glossary, modern spelling, and just in general be more approachable/readable than going straight to the First Folio. That can be fun, too, but it’s not for beginners. Ok, awesome. Now go get a movie version of Dream. Preferably several. This is most likely easier than it sounds – a quick search tells me that there are two versions streaming on Amazon Prime right now (the 2016 BBC version, and the all-star 1968 Peter Hall version). But a little searching on Hulu, YouTube, and other streaming sources will no doubt reap benefits. Is live performance better? No, not for this project. First, there’s the real world limitation that maybe Dream isn’t playing someplace convenient for you. But more importantly, you can’t pause live theatre. If you are unfamiliar with the play, then you are guaranteed at points to say, “Wait, what did he just say? I’m lost.” Sitting at home with the remote control, you’ve got that under control. 30-second rewind button to the rescue! Here’s the fun part, though. Ready for the magic? Turn on the subtitles. Would you look at that! Now you’ve got your own personal production of A Midsummer Night’s Dream being read to you, all while sitting comfortably in your living room with your copy of the script, a bowl of popcorn and your Snuggie. I’d love to say, “Just have the play open and follow along with the movie.” There are a few reasons why this doesn’t work. First, you’re constantly taking your eyes off the screen to read, which breaks your ability to understand the flow of the story. Second, any production you see is going to edit. They’re going to change words, they’re going to give lines to other characters, they’re going to cut large sections. If, every time they do that, you have to spend a few seconds saying, “Wait, where are we?” you’re just going to get lost. Watch the play this way. If you have the opportunity to see multiple productions, watch all of them. You’ll discover immediately that you can spot where the productions differ (in terms of what they cut) because sometimes you’ll be saying “Wait, the first one said X Y Z and this one didn’t” or “I don’t remember the first one saying X Y Z like this one just did.” If you get lost or confused, don’t be afraid to pause and rewind. Wait, you’re perhaps asking, how is that speed reading Shakespeare? Going through a couple of movies, reading it, then watching it again? That’ll take hours. Days. Well, yes. Speed reading is not “Go through it once, very fast, and you’ll absorb everything.” Speed reading is about making multiple passes through the material. You then use each pass to better structure your understanding of the material. The next time through you’re “filling in the gaps” you missed the previous time. The first time you watch the play you’re trying to follow the words but you’re mostly just getting the story – who are these people, and what are they doing? Watch it again and you know the people and the story, so you pay more attention to the words. I think, after going through this exercise, you’ll have a much better understanding of the play than if you (a) sat down and read the No Fear Shakespeare version, or (b) found a live production and suffered through that. I’ve got a version of King Lear that I have to get around to watching, and I think I’ll try my subtitles trick. I’ve read Lear and seen multiple productions, but I’m curious whether that trick gives me deeper insight into the text. I’m betting it does. Next ›So, Anybody Want To Pre-Read My Book? I like this idea. I’m in a reading group that reads one Shakespeare every year and then sees it live. I think I’ll recommend this process to the group, since a few struggle every year with the reading part. 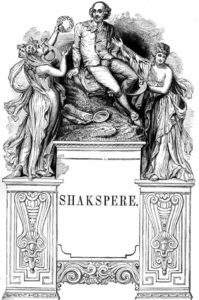 When my son taught Shakespeare to homeschooled HS students, he had them read a section of the play, they they watched two versions of a scene from that section – one from a film, one from a filmed play. They’d discuss the different interpretations. The final project – cast the play using actors from any medium, explain why, and which version you liked best – film or stage? Kids signed up for class after class because he made it interesting.